This entry was posted on Wednesday, April 15th, 2009 at 9:59 pm	and is filed under Insurance. You can follow any responses to this entry through the RSS 2.0 feed. You can leave a response, or trackback from your own site. Looking forward for the next comparison. I agree on the phrase “good agent is the best policy”. I myself am an ING permanent agent. Why I choose to be permanent? That’s because to ensure I serve my clients well. Insurance agent is not just about talking and selling. It’s a professional job as well. We have to study to be more knowledgeable and most important thing is we have to be ethical. What do you think? Anyone can tell me comparison between AIA and Prudential? Just what I need. Looking forward to it. All insurance product is GOOD, jus depand wat the agent sell and should sell with HEART = wat customer need. Alan, im not truly agree with you. Not all insurance is good and same. I dont like the statement ” All insurance just the same and good, the important is the agent” . This is the word i get from the agent which doesn’t know about his product. *based from my experience before I be an agent now. Agent is important, but the most important you have a good product. Y u r rite but we sell product to our customer must depand customer NEEDED and we also must sell with “HEART” . All product from insurance also got its own GOOD THING. But Agent knowledge also must 100% so that understand all the rule and benefit. i do like the sentence, good agent is the best policy. in that case,now tat i am an insurance agent for PRUDENTIAL. i do really thinks its important to really understand and compare the policies that you would like to buy before hand,as it is a life long “stuff” that will be attached to you.to buy with no regrets and to have a good and professional agent to service you upon needed is really important. so both are equally important. All Insurance GOOD GOOD !! if any want need info or sharing “PRUDENTIAL ” product can call me !! Make A Rite CHOICE !!!! For you to even put the above statement whether you are sure or not is already unfair. I have being a GE agents for the last 19 years & I am proud to said we have products for various needs. I believe we are able to cater to a wider group of people with all honesty. Rather that having a company that only have investment link products for a long, long time & the agent sell to each & every person the same. I m joining Great Eastern from 1994 until now…only one claim had been paid….the rest …lu pikir la sendiri….Great Eastern is VERY BAD CLAIM SERVIVES…. 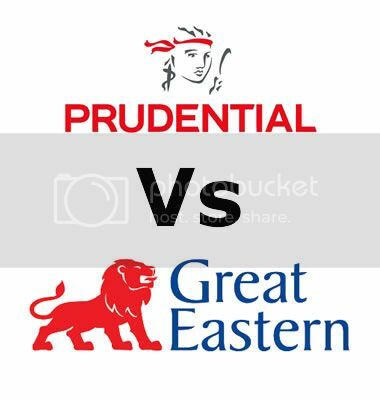 I myself bought my insurance from great eastern.once I try to compared a prudential product with great eastern.but I never heard anything from my great eastern agent Tat said other company product is not gud.but the other prudential agent just know Hw to said Tat other company product was not Gud,this n tat.I dun think tat was call professionalism.I think which is HUD really depends on Hw the agent do his job.salute to all dedicated agent no matter he or who from which company. well…GE is a gud company same goes to any other company…soo…peace and serve ur client well. Great Eastern claim process + customer service is really really lousy! I filed a claim since Oct’10, waited for 4 mths, no one called me to update the status. When I called to their customer service, they told me document was not completed. Gosh! I’ve even went to their branch to get help to verify my documents before submission…now cheque was issued but sent via normal post and went missing…A big company not even affordable to send the cheque via registered post? Even worst, asked me to write in about the cheque missing. Why should a customer do that while Great Eastern suppose to ensure everything is in place? Don’t try Great Eastern if you plan for insurance.. I always believe that all insurance are good. Here in Singapore,all financial institutions including insurance cos are highly regulated. So it does not matter where you get it from as long as it’s in Singapore registered. Professional agents should always have a systematic process before a recommendation. Sometimes it may include comparison with other co, wherein agent has to be honest. Most agents have this experience,but at the end of the day client will still choose to take up plan with you because of “your good relationship and service”. We do not need to badmouth other companies, it is not professional, in fact it’s shallowness. Insurance/ Assurance companies play important role in building a nation. And we agents are the field underwriters who reach out to people out there. With the knowledge and expertise, and most importantly the HEART of service, let us do our “calling” with enthusiasm and integrity. And for people who are reading these blogs, don’t rely on these blogs for your decisions, for you may end up with not taking any insurance. Approach an insurance professional and be genuinely interested to know more, listen with an open-mind. You are doing this for yourself and and for the love of your family. Insurance is like a parachute. It’s either you have or you don’t. If you don’t have and you need it, you would not need anymore. It’s time to service your customers, not to make quarrel about who the best and who the worst. Our words show how good our heart is, and these will reflect to our service. To all customers, choose the agent whom you know well. He may your relatives, your closed friends, so they could really help you when you need. None of Insurance Company is built to trick its customer. Have a good life. Life is great. ermm actually im would like to buy a policy for myself.I bet most of the comments above come from agents. haha, i also heard produa and proton sales rep. quarrel comparing their products before.. 😀 As for me, i’ll go for good policy. After sales service isnt a big issue for me as i would prefer to call customer service center, 24/7 i guess. I have friends who get their claims rejected from various company. so I think, claim is subjective matter..i believe if it is a genuine claim and follow all d procedures. i dont think any of insurance co in malaysia would reject d claim. if that happen, i should rise d issue to BNM. so to all agents, what is the best Takaful policy is d market? Im 25 Male, looking for coverage of RM100k with return RM500K at age of 55. how much the premium, any suggestion? Who know may become Millionaire by recruiting more agent. Please email me, if you want to know more.